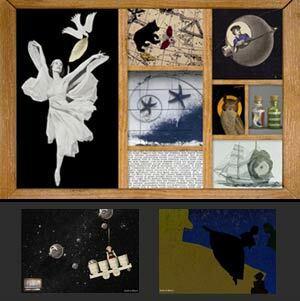 Created for the Peabody Essex Museum's major retrospective of Joseph Cornell this website explores the mind and endless intrigue brought forth by Cornell. American artist Joseph Cornell (1903-1972) has been celebrated internationally for his boxes, collages, and films since the 1930s. His mining of far-flung ideas and traditions and elegant integration of woodworking, painting, papering, and drawing define the innovation and visual poetry associated with his work. Above all, he forever altered the concept of the box from a time-honored functional container into a new art form, the box construction. Although Cornell's exploration of art, culture, and science was highly personal, even spiritual, his goal as an artist was to inspire others to pursue uplifting voyages into the imagination. This exhibition is organized thematically to suggest his understanding of the imagination as an echo chamber where possibilities and connections can be discovered through subtle repetition and variation. Each thematic section mingles the series, media, and time frames in which he worked. His lyrical, often surprising combinations of materials and ideas are usually associated with surrealism, a European art movement that emphasized dreams and poetic dislocation in the 1920s and 1930s. Surrealism, however, was just one of many resources that Cornell called upon as an artist driven by innate curiosity and creativity rather than by theories and formal art training. He often described himself as a maker because he valued his natural� and spontaneous� origins as an artist. Making something new from nothing or the pre-existing is critical to the processes of many self-taught artists. It is also central to the modern concept of creativity as the collision and recombination of ideas. Traditions can be reinterpreted; connections can be forged between the seemingly random or disparate. Cornell believed that artists renew and transform materials, experiences, and ideas, and this belief fueled his ability to communicate the beauty and magic in ordinary, often forgotten things.